The first study says nearly 1.5 billion adults in the world are overweight, and half a billion more are obese. 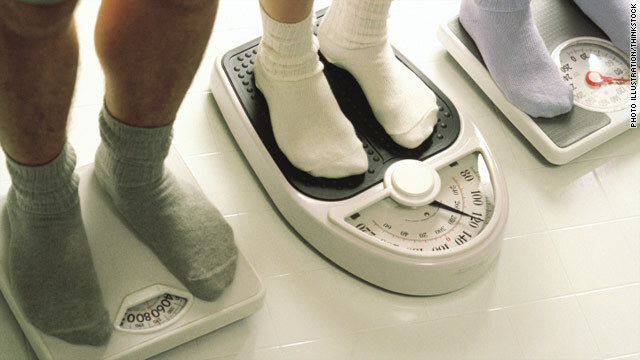 Obesity is defined as having a body mass index (BMI) more than 30. That’s equivalent to an adult who's 5 feet 6 inches weighing more than 185 pounds, according to the U.S. Centers for Disease Control’s BMI calculator. The Lancet report says that the obesity rates for different countries vary dramatically due to environmental factors in those countries. For example, they found “traditionally high levels of active transport," specifically bicycling, in the Netherlands contributed to a lower rate. Only 1 in 10 women there were categorized as obese, while high levels of car use in the U.S. contributed to obesity. In the United States one in three women are rated as obese. The authors believe that the most effective way to stop obesity is governmental policies, including things like banning unhealthy food for children, shifting agricultural policies to promote health. Obesity is on the increase, and nations who fail to stop it could face consequences, according to the second study included in the Lancet’s series. The report says that following current trends, there could be 65 million more obese adults in the U.S. and 11 million more obese adults in the United Kingdom by 2030. Obesity can cause diseases including diabetes, heart disease, stroke and certain forms of cancer. "If these trends continue, by 2030 50% (of) U.S. Men and 45% to 52% (of) U.S. women will be obese,” says Dr. Y Claire Wang of the Mailman School of Public Health at Columbia University, one of the authors of this study. The report says that as obesity goes up, so will the amount of money spent treating people who suffer from it. Wang adds, “In many cases being overweight at age 50 will not only double but actually triple or quadruple the incident rate for many diseases.” In the next 20 years, the report concludes, obesity could result in 6–8.5 million cases of diabetes, 5.6–7.3 million cases of cardiovascular diseases, and more than half a million new cancers in the U.S. and the United Kingdom. Wang anticipates that by 2030 the cost to treat people for these diseases in the U.S. will be about $66 billion a year, and 2 billion pounds a year in the U.K.
Another part of the Lancet’s special report looks at how people can lose weight. Many recommendations for weight loss suggest that people will slowly and continuously lose weight if they cut 500 calories a day from their diet. Dr. Kevin Hall of the U.S. National Institutes of Health says it doesn’t really work that way. He put it bluntly: “Let me be very clear. This is wrong. This does not happen.” Hall says it would be true if your metabolism didn’t change, but we know it does. In his report, the team created a computer program that could eventually be used by clinicians to model weight loss. Team members say their program is a more accurate model and accounts for initial body composition and changes in metabolism as you diet. The computer’s predicted weight loss is significantly less than other formulas suggested, but the authors believe it’s much more realistic. The final report in the series says governments must take the initiative in battling obesity. Next month a meeting at the United Nations will address noncommunicable diseases, including obesity. The authors of these studies called for the world to take action. To all of you people who exercise (run, lift weights, etc) please quit complaining about the BMI scale not being accurate for your lifestyle. You work out, that's great. So do I. I would also understand that a BMI scale telling me I'm over/under weight wouldn't be accurate if I know I'm eating right and routinely exercising. Have a body composition test, where % body fat is measured, much more meaningful data. i'm sorry about your wife. i can't imagine the pain and trauma she has experienced. rheumatoid arthritis alone is painful and debilitating (for most). add in being hit by a drunk driver and a fall down the line? i am so sorry. i cannot imagine. aside from tonight (not sure why i read the board on this article), i've pretty much stopped reading the comments section. i've learned reading these boards is usually leaves one's heart pumping a little faster or one's jaw clenched. it isn't worth it to read them - tell your wife to read a book or something that'll make her laugh or inspire her or feel good. not this crap. you don't need to write in all caps, it make you look like a troll. also, i don't think the author was targetting disabled people, but rather lazy people who know better and can help themselves. perhaps if she hadn't been overweight, she wouldn't have slipped so easily. I'm thin and hardly every slip. But I see fat people lose balance all the time. Its a vicious circle my friend. Get your fatty wife to lose some weight. Plus it will help the environment. You do want that, don't you? Prednisone causes weight gain even without lack of mobility. Lots of psychiatric drugs also cause weight gain. To the poster Joe who believes fat causes people to slip and all thin people have perfect balance because he does and he isn't fat: are you serious? Anyone can fall, at any time. All kinds of conditions cause loss of balance, and none of them are associated with being fat. Calling this guy's wife "fatty" makes you sound like a mean-spirited 12-year-old. Hopefully you are, because it is depressing to think that an adult could be this clueless. Why not cultivate a sense of compassion in yourself; it will do more for the environment than any amount of weight loss. Older people slip and fall. It's a consequence of getting older. An older person with some extra weight is a little less likely to break a hip than a thin older person. World is getting fatter because of corruption in the food industry. They dump addictives into the industrial foods that they are forced to buy through propaganda and brainwash advertising. Then we get taken for a ride because the same captains of industry control government. It has nothing to do with sedentary lifestyles and poor food choices by the individual? Y'know, normally I would agree with this- but now I have discovered that different people have totally different densities!! My black college roommate appeared a little on the chubby side, a healthy, cute, chubby- she is extremely athletic and is built like an ox! Able to do 60 push-ups in 60 seconds! She was 5'4 and a little over 200lbs... she had trouble swimming.. dude, no wonder! I was like: 'what the heck! are you kidding me?!' when she told me her weight- I would have never guessed. Just thought I'd let you guys know~ not everyone 'obese' is actually obese. Why does it matter that she's black? Just curious. I dunno, dude...there are lot more skinny alcoholics than not out there that pretty much blow that theory out of the water. With 34 percent of the adult population and 17 percent of the adolescent population currently considered obese, treatment for obesity and its health consequences accounts for an astonishing $147 billion of our country’s annual health care spending. The American Medical Association recognizes obesity as a major public health concern and is committed to helping physicians address lifestyle behaviors with their patients. It is clear that we must take steps to help prevent and treat obesity – for the health of our families and the financial health of our nation. I am a former special education teacher and I wrote a children's picture book that tackles the issue of childhood obesity. Hunka Chunka Monkey Shapes Up entertains children without being preachy. It places a simple truth as a foundation in their hearts.....to cut back on their favorite snack, become active and make new friends. Chris Powell of ABC's Extreme Makeover: Weight Loss Edition reads my book to his children every night. He stated on his FaceBook, "The kids are requesting Hunka Chunka Monkey Shapes Up for their bedtime story tonight....AGAIN! This is the third in a row, but I love it. What a great message of healthy living for children:). Nicely done, Sam E Bromley!" Chris's wife, Heidi Powell, used such words as 'amazing' and 'brilliant' when describing my story! I am excited about getting this message out. You can go to YouTube.com and type in my book's name: Hunka Chunka Monkey Shapes Up and see a brief message about my story! Please pass this on for all to see and partner with me and let us stop the obesity problem in America by encouraging the very young to skip, run and jump their way to a better life and a better future! Advertising for who, here? And how much will you be making from the sales of your book, Sam? If you really care, are you willing to forego profit to help the kids whose families cannot afford healthier food choices? Betcha you wouldn't. bez ogródek, iż wielce. Dostajemy po dupsku w każdej dyscyplinie i nie jest istotne czy gramy w nożną, siatkówkę czy koszykówkę we wszystkim gonimy ogony i nie możemy w stanie odnieść żadnych znaczących sukcesów, Jest to dołujące i mam już tego dosyć. Brakuje mi aktualnie wielkich nazwisk i postaci w naszym sporcie. Ciekawe kiedy to się odmieni. Przepraszam pesymistyczny, jestem niesłychanie rozczarowany. przede wszystkim. Hey FATTY!! QUIT READING THE COMMENTS SECTION AND GET BACK ON THE TREADMILL!!! are this medicines really helpful , is there any diffrence between generic and branded ones , Should i buy a branded one? Magnificent web site. Plenty of helpful information here. I am sending it to some friends ans additionally sharing in delicious. And of course, thank you on your sweat! You already know therefore considerably in the case of this subject, produced me individually consider it from numerous various angles. Its like women and men aren't fascinated until it's something to do with Woman gaga! Your individual stuffs outstanding. All the time maintain it up! How about instead of adding more government control, we take it out. Stop the government funding that provides healthcare. The healthcare is the burden everyone takes on for the many people who willingly (and sometimes unwillingly) become obese. People might take their health more seriously if they had to pay for it themselves. I'm tired of having to pay for everyone else...hell, I'm annoyed that I never get days off for being sick because I'm so healthy while my coworkers are out using every last day they can afford...fair, huh? if you are out there passing through any of this problems or predicaments in your life. try him any you will forever remain happy. Glad i found this. Thank you again. Pregnant girl.